With the body of a shark, flat undercarriage of a manta ray and snout like a lumberjack’s saw, the ancient giant sawfish’s structure would find a likely home in a Dr. Seuss book. It lived 65 million years ago, during the upper cretaceous period and grew to 26 feet long. As the features of the sawfish are studied, the comical appearance fades with the understanding of its design. Like the rays of today, the sawfish spent most of its time lying semiburied in the muddy bottom of the ocean. As it was generally lying on top of its mouth and nostrils, it breathed through a special opening behind its eyes. Since the ocean bottom is so murky, relying on sight to detect prey is rather futile. The giant sawfish also had an intimidating eight-foot-long blade called a rostrum that protruded out from its head. A highly specialized sensing organ, it was hard and covered with electro-sensitive pores that could detect the slightest motion, as well as the beating hearts of its prey. Attached to the rostrum were barbed “teeth” that could impale fish. Although resembling teeth and even being structurally the same, the sawfish “teeth’” were actually modified scales. When suitable prey was detected the sawfish sprang into action, slashing its saw blade back and forth, thereby stunning, injuring or impaling the fish. The “teeth” bare an obvious semblance to today’s fishhooks and – in much the same manner – once a fish was hooked, it had little chance of being freed. It also used its blade to dig out crustaceans hiding under the sand and to defend itself. Predators are thought to have included the spinosaurus and the ancient crocodile. 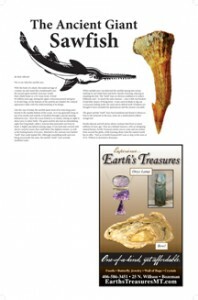 The giant sawfish “teeth” have been fossilized and found in Morocco. Due to the minerals in the area, some are a multicolored yellow/ orange/red. Fossils educate and tell stories about creatures that lived so many millions of years ago. They are a limited resource, with an intriguing natural beauty. Earth’s Treasures invites you to come and see rarities from around the globe, while learning about what the natural world has to offer. Visit us at EarthsTreasuresMT.com or stop in the store at 25 N. Willson in downtown Bozeman.